Deep beneath the keep of Castle Greyhawk, a really nasty device is creating mutated, unpleasant monsters that are running wild throughout the castle and the twelve-level dungeon beneath. The call has gone out for heroic, fearless, and perhaps foolish adventures to out-hack, out-slash, and sometimes even out-think hordes of doughmen, headless mice, manic bee queens, really bad dead things, burgermen, crazed chefs, and movie moguls. If they survive these and much odder obstacles, the characters still have to find the nasty monster creator and put it out of business. Castle Greyhawkcontains 13 detailed levels for adventuring and exploration. Each is a separate adventure written by different author and each has its own unique brand of baffling weirdness. Some levels involve solving puzzles and some require good old hacking and slashing. The adventure can be played separately or all together as a grand quest to free Castle Greyhawk from the evil, rotten hordes that are plaguing it. The common theme of this dungeon is that no joke is so old, no pun so bad, and no schtick so obvious that it can't be used to confuse and trip up PCs! 13 Adventures for Character Levels 0 to 25. 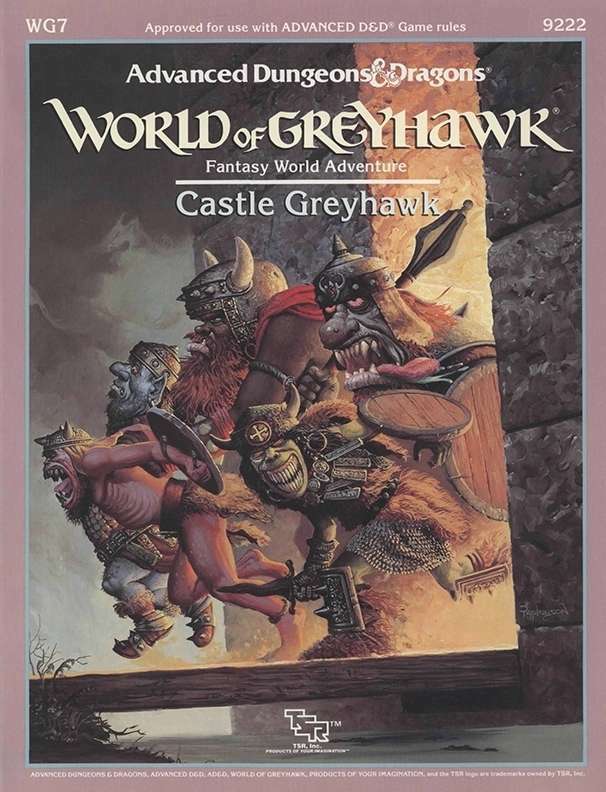 WG7: Castle Greyhawk (1988) was theoretically the seventh adventure in the World of Greyhawk series and (theoretically) depicted the infamous Castle Greyhawk. It was written by a huge collection of authors and released in January 1988. An Adventure Anthology. Though Castle Greyhawk presents a single dungeon, it's actually an adventure anthology, with each level written by a different designer. The first D&D adventure of this sort was B9: "Castle Caldwell and Beyond" (1985), but it was a singular experiment at the time. For some reason, TSR suddenly became very fond of anthologies in 1988, with other releases including DL15: "Mists of Krynn" (1988) and OP1: Tales of the Outer Planes (1988). Not Expanding Greyhawk. Gary Gygax may have created the Castle Greyhawk dungeons as early as 1972. He promised publication as early as 1980, but only got as far as publishing adventures based on "demiplanes" that were connected to Castle Greyhawk. In the end, there were three: EX1: "Dungeonland" (1983), EX2: "The Land Beyond the Magic Mirror" (1983), and WG6: "Isle of the Ape" (1985). As for the actual dungeons, Gygax never published them, and this adventure definitely is not Gygax's Castle Greyhawk. In fact, this satirical adventure isn't really a World of Greyhawk adventure, despite its "WG" product code. TSR purposefully superseded it just a few years later with WGR1: "Greyhawk Ruins" (1990) - a better attempt to match the style of Gygax's dungeons, though that one didn't directly derive from Gygax's campaign either. Ironically the other major Greyhawk project from this time-period - Rose Estes' "Master Wolf" series of novels (1987-88) - are also of questionable canonicity. Historically, Castle Greyhawk falls between the first two major waves of Greyhawk publication: after the last Gygaxian reprint, S1-4: Realms of Horror (1987), and before the first serious release by someone other than Gygax, which was Greyhawk Adventures (1988), by James M. Ward. The Missing WG7. The Acaeum reports that WG7 should have been an adventure by Gary Gygax and Skip Williams called either "Shadowland" or "Shadowlords." Gygax had first announced it way back in The Dragon #37 (May 1980), where he wrote, "Skip Williams is working on my original outline for Shadowland, and from what I’ve seen so far, we should be able to have a final product out this year. The module will be an adventure on the Plane of Shadow - perhaps that should be Quasi-plane of Shadow." Years later, Gygax noted that he and Williams had created lots of new monsters for "Shadowland" and that he'd outlined an adventure for high-level PCs, 12th and up. Gygax and Williams were once again working on Shadowland around 1985 when Gygax was forced out of the company. As a result, his version of WG7 appeared in a few TSR product catalogs in 1986 and 1987, but was then cancelled. Parody & Humor. Though it wasn't the original Castle Greyhawk, this Castle Greyhawk was enjoyed by some for its parody and its humor, which included references to Star Trek, the Marvel Heroes, the Three Stooges and much more. Some parodies and other D&D humor had appeared in April issues of Dragon previously, but as a fairly humorous supplement, Castle Greyhawk was pretty unprecedented. Was This Castle Greyhawk Produced Out of Spite? Fans of Gary Gygax and Greyhawk have long contended that this version of Castle Greyhawk was produced specifically to spite Gary Gygax, to mock his creations, and/or to make Greyhawk and its prime adventure spot look ridiculous. This assertion is questionable. Admittedly, Lorraine Williams might have had spiteful feelings toward Gygax, dating back to his attempt to block Williams' purchase of TSR stock in 1985. After that, she appeared to go out of her way to sue both companies that Gygax later published with: New Infinities Productions and GDW. In fact, the TSR lawsuits against those two companies were some of the prime causes that ultimately drove them out of business. However, laying out that history of anti-Gygax litigation doesn't necessarily suggest that Castle Greyhawk was produced as a purposeful slap in his face. In fact, there were so many freelancing professionals involved with it that it's clear that at least the authors, at least, didn't intend to mock Gygax. Whether the TSR staff who edited the book might have been willing to do so is harder to say, as in the early 80s there had been some real resentment toward Gygax from some of the creative folks. The bottom line? We don't know if the overall concept was purposefully spiteful, but we can say pretty safely that the specific dungeon levels as written weren't. About the Creators. Another argument against Castle Greyhawk being produced out of spite? The all-star cast of authors: Fantasimulations Association, the creators of FASA's Star Trek RPG (1983); Greg Gorden, one of the creators of DC Heroes (1985); Paul Jaquays, a well-known illustrator and author for Flying Buffalo, Judges Guild, and TSR; John Nephew, the future founder of Atlas Games; Steve Perrin, author of RuneQuest (1978); Rick Swan, a frequent TSR writer from 1988-95; Ray Winniger, another Mayfair Games star, who'd soon be better known for his work on second edition DC Heroes (1989) and Underground (1993); and many others of note. My one issue with this is that whoever scanned the module did not convert the image to text or do any bookmarks. It would just be very convenient for an adventure of this length.